Cabin guest rooms, RV sites, campgrounds, horse corral and stable. 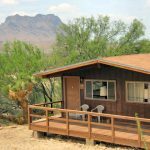 Terlingua Ranch Lodge offers 32 cozy, clean and quiet cabin guest rooms (#27 thru #58) with great views of the surrounding Big Bend area mountains by day and a universe full of stars and galaxies at night. 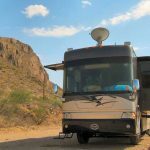 Terlingua Ranch Lodge RV park offers 8 pull-through Upper RV sites (#14 thru #21) with power/water/sewer connections plus 12 back-in Lower RV sites (#1 thru #12) with power/water hookups and a handy dump station. 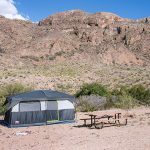 Our Big Bend campgrounds offer seven private tent campsites (#1 thru #7) , two open camp grounds (Campgrounds A & B) with shared water spigots, and a horse camp for dry horse trailer camping. 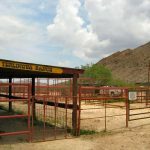 Our horse corral is conveniently located near our front office and offers several 10′ x 20′ pipe pens, two large turnout paddocks and loading chute. Shade and water are available but please bring your own hay and feed.